Do you want to make a difference in your own community? You have neighbors that are struggling to read. Do you want to teach someone to fill out a job application? Do you want to teach someone to read a book to their grandchild? 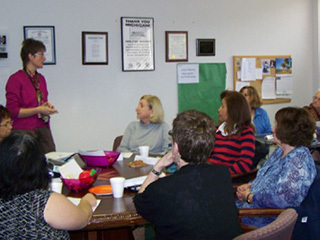 Do you want to teach someone skills needed to enroll in a training program? You also have neighbors that are struggling to communicate because they don't speak English. Do you want to teach them how to have a conversation with their doctor or their child's teacher? Do you want to teach them to get a job and get a promotion? Do you want to teach them to pass the citizenship exam? Help them to become confident, achieve their goals and make your community a better place for all of us. 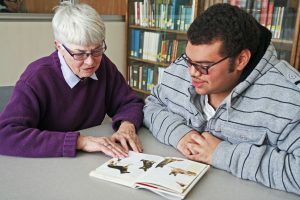 Join us by becoming a literacy tutor…give the gifts of reading and communicating to someone who lives or works in your community. You will be able to tutor in your local community at a public building (libraries are a great spot) and at a time that works for both you and your student. We ask tutors to commit to tutoring for at least one year and to meet at least two hours per week year round (vacations are ok). Making a positive difference in someone’s life, can make a positive change in our whole world. Many tutors report that they have learned so much more than they expected. No teaching experience? No problem. We provide our incoming tutors with an e-learning course and 6 hours of classroom training to prepare you for your first assignment. 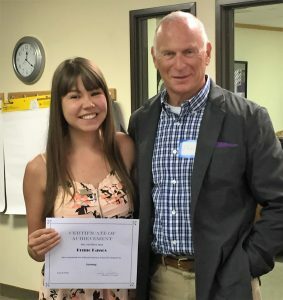 Tutors are certified after completion of training. After you are trained and have met your student we ask you to come back and spend an hour and a half creating a plan for your student. We also provide ongoing support to tutors in the form of a tutor coordinator, workshops, tutor-to-tutor events, an online forum and training materials. You won't be alone. STEP 1: Sign up to take our e-learning course where you will learn more about the Oakland Literacy Council, who our students are, and what it takes to be a successful tutor. STEP 2: After completing the e-learning course the next step is to register for an in person training session. The schedule of upcoming training classes include:. STEP 3: Meet your student and come back for the follow-up training to develop lesson plans. We look forward to welcoming you to the Oakland Literacy family.